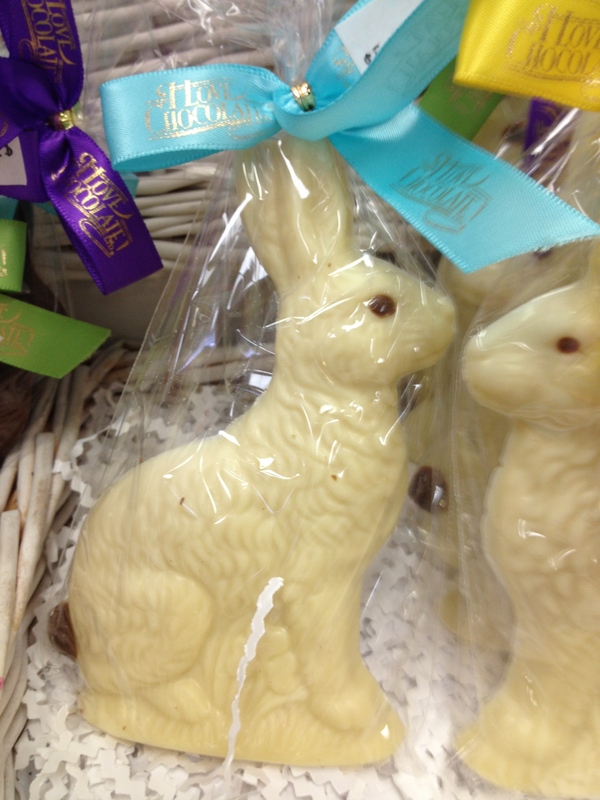 I LOVE CHOCOLATE – The Search for the Old Fashioned Easter egg. 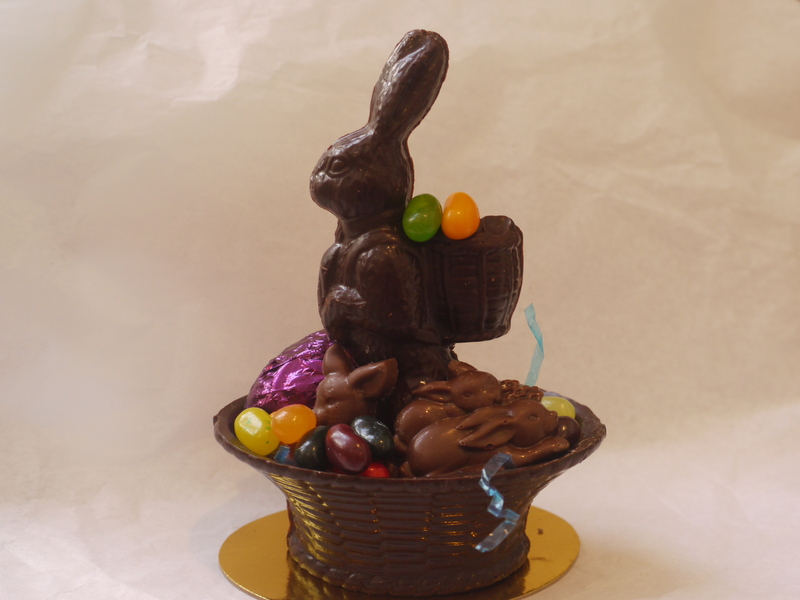 When I stepped through the door of I LOVE CHOCOLATE I became a child again; in my Easter bonnet, new dress and carrying a straw Easter basket. In the basket was a big chocolate Easter egg with and my name was printed neatly in icing. Easter is here and in my search for chocolate egg history, I asked the question,“Does anyone make Easter eggs and Bunnies – the old fashioned way? My search for Easter egg history wowed me with information about traditions and the many people that are needed to harvest and produce chocolate. Easter will never taste the same. I LOVE CHOCOLATE uses Belgian chocolate for its confections, so I researched a bit of the history of chocolate made in this country. When Belgium colonized Congo, they began shipping cocoa beans from that country. Belgium became particularly famous for their chocolates in 1912 when they began making PRALINES – chocolates filled with a creamy white filling. Belgian chocolate continues to be famous for high quality. There are thousands of chocolate makers in that country who continue to making chocolate by hand, using old traditional equipment. The various mixtures made by Belgian chocolatiers result in rich, dark, flavourful chocolate, with a distinctive taste from Swiss and German chocolate. The difference in taste is in the beans and the blending ingredients used. Belgian chocolate has become popular worldwide. The eggshells of different birds have been adorned as a form of art long before the time of Christianity and adorned eggs have been found all over the world. The French and Germans introduced chocolate Easter eggs to Europeans in the early 1900’s, after a new mixture became available that could be poured more easily into molds. 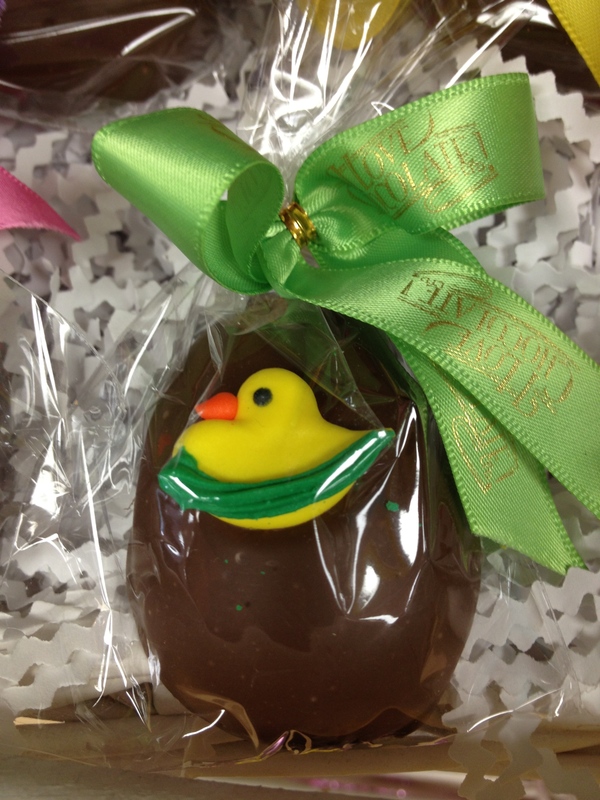 It was originally popular to mold a hollow chocolate egg and fill it with sugar covered almonds. Eggs were later decorated with marzipan and icing piped into ornate decorations. Easter eggs evolved through the years and changed in style, from ornate Victorian decoration to more whimsical designs. Now even chocolate dinosaur eggs have become trendy. The creation of high quality Easter eggs and bunnies starts with the farmer in Africa or Central America who harvests the cocoa beans from trees. The growers and harvesters are the unsung heroes of the chocolate world. There are so many steps between picking the pods to the molding of the Easter delights that we take for granted with our “grocery shelf” mentality. The steps include: growing the cacao trees, harvesting the pods, fermenting pods, extracting and shelling the beans, roasting and grinding the nibs, (parts of the bean used to make chocolate) extracting the chocolate “liqueur,” and mixing other ingredients to make the chocolate creamy and smooth. That all happens before the chocolate is molded into shapes to decorate. I learned so much after stepping through the doors of the I LOVE CHOCOLATE shop. 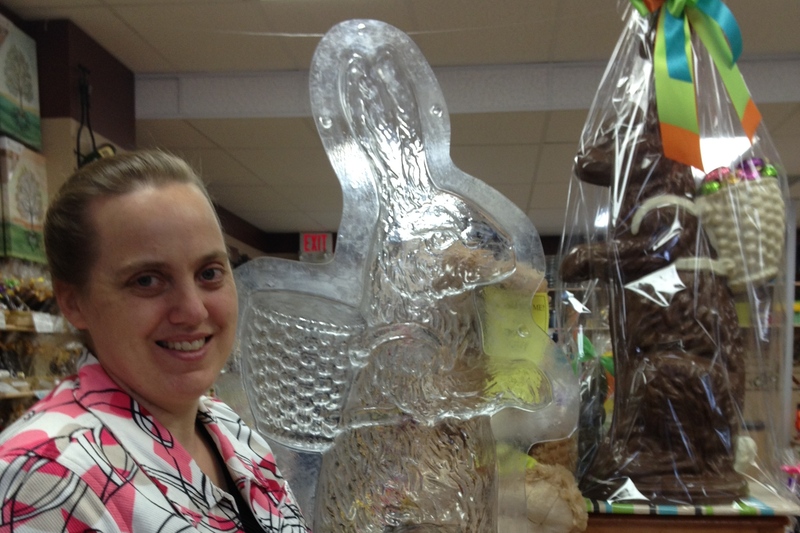 My Easter bunny is Krista Byers, chocolate maker. Every time I take a bite of chocolate at Easter, I will remember the holiday’s roots, and all the people who have worked to bring the chocolate from the ground to make my Easter special.